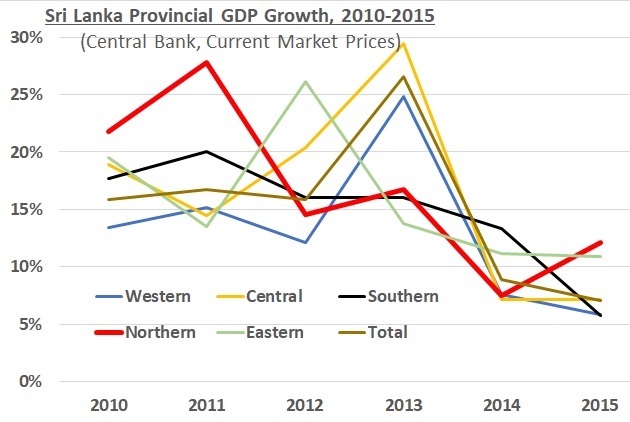 The Northern Province had the joint highest GDP growth rate that year. 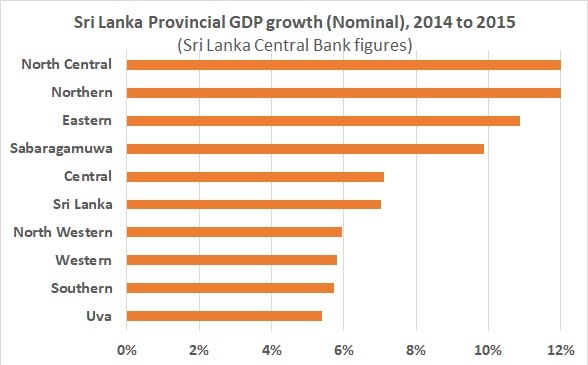 Mathematically if the Northern, Southern, Eastern, Central and Western provinces’ GDP Per Person each continued with their same 2015 growth for the next 14 years then in terms of GDP Per Person the North starting from its current last place would catch up with the Central and Southern provinces in about 4 years, with the Eastern province in 10 years, and would even overtake the Western province in 14 years. Exhilarating stuff? Probably not. , is not encouraging with the North seemingly following the inevitable trajectory of Wile E Coyote in a Road Runner cartoon. 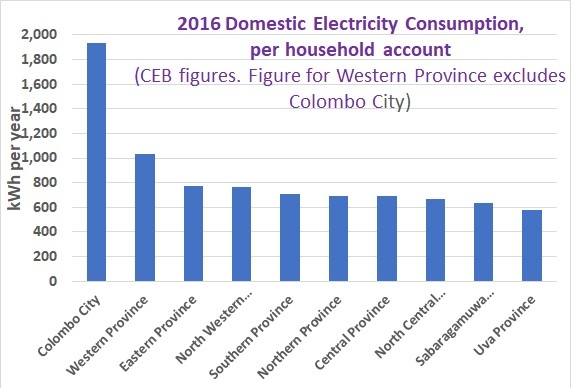 Despite this relatively high growth in 2015 the North firmly remained the poorest province in Sri Lanka. I have frequently heard it said that these Northern GDP figures don’t reflect the alleged flood of remittances from the Tamil Diaspora to family and friends in the North. It is doubtless true the Diaspora is still sending money to the North. But how much and how widespread seems to be unknown. I have informally asked about this from people ranging from a senior Central Bank official in Colombo to retail bankers based in Jaffna. They have said the data must be there somewhere but they are not sure where. 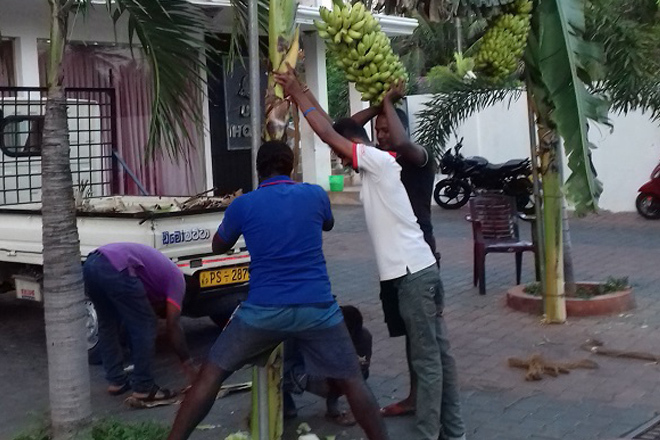 [I would be grateful to anyone who can provide reliable data to show how much money coming into Sri Lanka from the Diaspora is going to support the Northern economy not just to buy condominiums, cocktails and canapés in Colombo]. show this is not the case. Nothing much happened on the KKS Harbour project until 2017 when the government, at last, decided to accept the loan. One hopes the money will be used for the intended purpose soon, with ships coming and going from KKS bringing visitors and exporting goods to boost the Northern economy. But one isn’t holding one’s breath. The Palaly Airport saga is a classic example of Sri Lankan Tamil Push-Me-Pull-You politics. 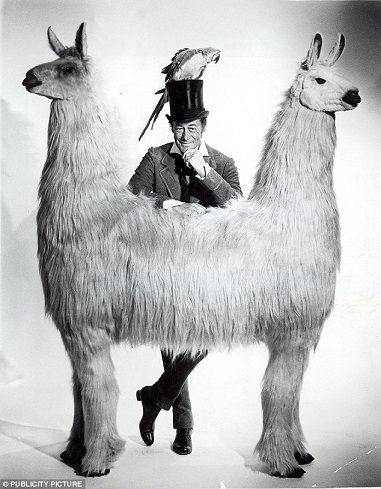 Like the two-headed comedy llama from the Dr Doolittle children’s stories, our venerable Tamil political leaders pull in opposite directions to themselves and childishly seem to do little. 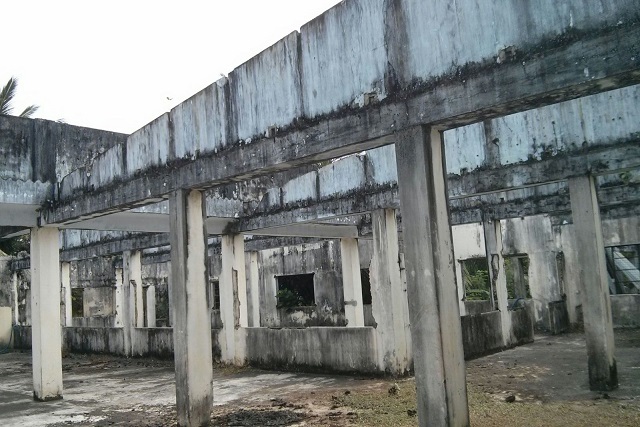 The Northern Provincial Council first demanded direct flights from Palaly to India in 2014, and then two years later in 2016 the same council objected to the airport being extended. Which will mean only smaller planes, with smaller passenger and cargo capacity, would be able to use it? To date, Palaly Airport remains an expensive gateway to Jaffna for passengers from Colombo and Trinco carrying not more than 15kg of luggage who are prepared to suffer the indignity of themselves being weighed in public before boarding. I suppose as the planes are quite small the chubbier travellers must be distributed evenly so they don’t wobble the aircraft. The repeated announcements over the years of the refurbishments of KKS Harbour and Palaly Airport has been like giving your kid a Rs5,000/= cheque for Christmas, not letting him cash it, and then giving him the same cheque the next Christmas. And then again year after year presenting the kid with a used envelope containing the same uncashed cheque. After a few such cycles, it is the frustration, not the anticipation, that becomes unbearable. – Is a temporary concession, available only for 3 years from 1st April 2018. – Applies only for brand new projects that don’t start before 1st April 2018. – Only available to brand new companies, that haven’t done anything material prior to this project. Why only brand new and why not until April 2018? Why not activate this allowance immediately? Or at least activate it for investment spending done after 1st April 2018 even for projects that started before that date? And why “brand new companies”? New companies will find it harder to raise cost-effective finance unless they are subsidiaries of established groups. Why are existing companies wanting to rebuild themselves from the effects of the war excluded from this benefit? Those with a suspicious nature may think this concession is craftily crafted to impede projects rather than encourage them. I understand representations were being made to the authorities, so perhaps the implementation of the legislation will ultimately prove more seductive to investors. 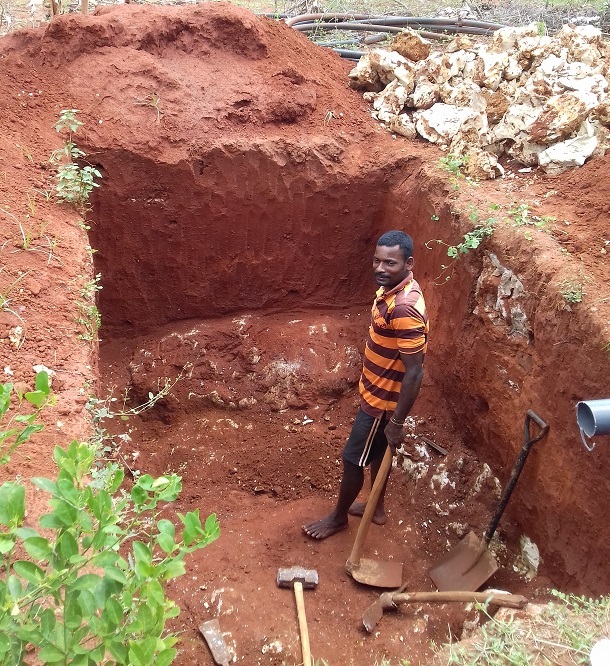 Therefore those who actually want to recover and invest in their land need to be quick. While those who have lost interest or are feeling generous should allow the current occupants to obtain good title and develop the property themselves. To generate some good Karma original owners could legally write the property over to current occupants for avoidance of all doubt. So the current occupants don’t get displaced by some other influential entity throwing its weight around as sometimes happens in our country. Over the decades politicians have invoked the enormous gifts of our country including its natural and diverse beauty, its strategic location, and the potential of its people, to promise that Sri Lanka will become the Hub of South Asia. We are, according to various government promises, to become the following hubs: Financial; Trade; Services; Goods; Naval & Maritime; Commercial; Aviation; Energy; Distribution; Oil; Knowledge Based; Traditional Knowledge; Cultural Expressions; Education; Startup; Design; Fashion; Innovation; and Shopping. Inspite of this hubbub of hubs, the Sri Lankan economic cart has many more punctures leaking deficit dollars and corrupt cash than it has money spinning hubs. 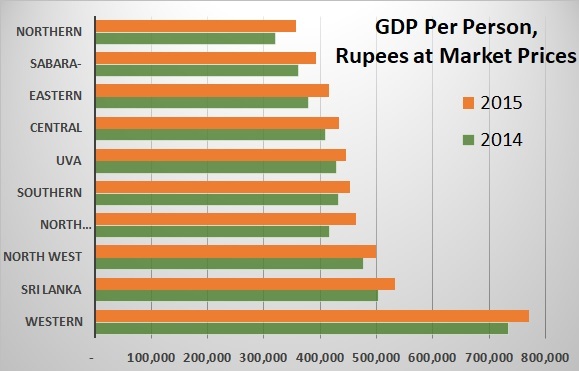 Successive governments have a poor economic record for all provinces outside the Western Province, as can be seen from the GDP Per Head graph near the top of this article. Even then it’s no consolation for the neglected North that other Southern provinces are also being woefully neglected. The North can’t rely on the government alone to make it rebound economically. The North needs the private sector to become the prime actor. Given the right tools and training, provided with good management and good market access, and also with decent investment, the North can dig itself back to prosperity. The North in its current state is a quick place to lose money and a slow place to make money. The private investors who choose to come North need to be determined and need to be patient. A tiny handful have come, but many more need to come soon. ( — The writer Jekhan Aruliah was born in Sri Lanka and moved with his family to the UK when he was two years of age. Brought up in London, he graduated from Cambridge University in 1986 with a degree in Natural Sciences.